It was 225 years ago, 15 December 1791, that the United States Congress approved the first ten amendments to the United States Constitution, permitting The Bill of Rights to become an integral part of American Law and life. The Bill as originally submitted actually included twelve amendments but only ten were passed on this date. The Bill of Rights, perhaps more than any other component of the United States Constitution, ensured that America’s bold experiment would have a unique and enduring place in the annals of human progress and human freedom. No previous government had ever explicitly and forthrightly placed such fundamental constraints upon its power, and certainly never at its very outset. True, there was precedence in this area – Magna Carta is often cited as the conceptual ancestor of The Bill of Rights, and the 17th Century English Bill of Rights was clearly influential as well – but nothing of this scope and scale had ever been established before. As other nations revolted against their colonial rulers, particularly in Latin America, similar limitations were incorporated into new constitutions. Few have been as enduring and as influential as our own Bill of Rights, however. The notion that the government derives its just powers from the consent of the govern had been proposed long before the American revolution, but the notion that a government would itself limit its own powers was a new thing under the sun, and this made the beacon of America shine even more brightly in a world yearning for freedom. We really should applaud the courage and integrity of people in government who, well remembering the abuses against which they had revolted, decided to hold true to their values and ensure that their new government could not lapse into the old tyranny. Just to note, the Eleventh Amendment was never ratified. The proposed Twelfth Amendment was finally ratified 7 May 1992 as the Twenty-seventh Amendment! Modern scholarship has determined that the invention of writing occurred just three times in Human History, each independently. The oldest source of an alphabet is considered to be Egyptian hieroglyphics. These predate the oldest known Chinese pictographs by close to a millennium. The oldest Chinese writing is found on the so-called oracle bones which date to about 2000 BC. Chinese writing and Egyptian writing arose independently. In the Americas, the Maya created a writing system around 700 AD. Now, we certainly know that there are many, many other writing systems in the world today, many more than just three “ur-scripts.” But all variations derive from one of these three sources. For example, Korean and Japanese each use modifications to the classical Chinese `alphabet’; Phoenician, Greek, Arabic, Hebrew, Roman/Latin, and Cyrillic, and even Norse Runic scripts, all derive from Egyptian demotic. There have been cases of intentional invention of new writing systems based upon the example of an alphabetic model. These invented scripts often have little resemblance to the model scripts, yet they are nevertheless derivative. Examples of this include Cyrillic, created by the Greek monks Cyril and Methodosius who made extensive modifications to the Greek alphabet in order to represent the many distinct sounds of Old Slavonic; the Cherokee Alphabet created by Chief Sequoyah (whose name is immortalized in the redwood genus, “Sequoia”) and the Korean Hangul Alphabet created by the Chos[eou]n King Sejong and officially promulgated in 1446. It’s pretty rare to know who invented a writing system. Hangul and Cherokee were both invented in historic times, but most systems are really older than written history, and so the geniuses who created them are unknown to history. However, the Chinese have several different mythic attributions for the author of their writing system, and the Greek myths credit the Greek alphabet variously to Hermes, Perseus, Cadmus, Palamedes, and even Homer. Basically, no one knows who the credit belongs to, and of course it is really deserved by the Phoenicians in the first place. The Romans were cognizant of the fact that their alphabet derived from the Etruscan model, and — perhaps less poetic or less romantic than the Greeks — they never attributed its creation to a mythic source. However, the Romans were keenly aware of the benefits that an alphabet provided, and from the very early days of Rome, they recorded events in their history on tablets and stones. The oldest known Latin inscription was long thought to be the Praeneste Fibula, an ornamental cloak clasp that had been dated to the very earliest days of Rome (7th century BC.) However, its authenticity has been challenged recently, and most sources now describe the “Lapis Niger,” “Black Stone” as containing the earliest extant Latin writing. The dating for the Lapis Niger is between the 7th and 5th Centuries BC. Some sources offer a different early inscription, the Duenos Inscription as the authentic oldest surviving Latin writing. The Duenos Inscription has been confidently dated to the 6th Century BC. In any case, the Romans had been writing for a good long while. Originally, Latin pronunciation made a limited distinction between “C” sounds and hard “G” sounds and so a single character sufficed. 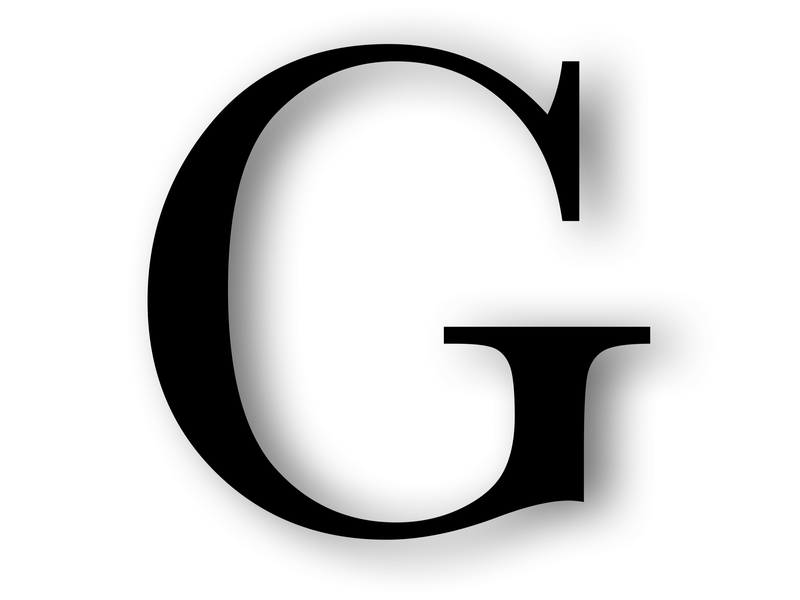 (We often hear hard “C” and “G” crosses: “example” pronounced as “egzample” or “significant” said “signifigant.”) As the Latin language evolved and pronunciations changed, the lack of a written distinction between “C” and “G” was proving problematic. The praenomen “CAIVS” was pronounced “Gaius” and “CNAEVS” was pronounced “Gnaeus.” (This is why Gaius Julius Caesar is often abbreviated C Julius Caesar.) Yet there was no way to make clear to the reader the distinction between “CVSTOS,” guardian, and “GVSTOS,” tastes. In the third century BC, a Latin schoolmaster established the first formal Roman school for tuition-paying students. He is well known in the surviving literature because he was recorded to be the first Roman to divorce his wife! But he is also known to have developed a regular and standardized curriculum for smaller children. Discovering that the “C/G” confusion was a stumbling block for his pupils, he added a cross stroke to “C” to indicate when is was to be pronounced as “G.” Thus — uniquely among our Roman alphabet — we know who invented the letter “G,” and we should be thankful to Spurius Carvilius Ruga for this useful contribution. It is fine to write what one thinks; it is the privilege of man. Nota Bene: some ancient sources attributed the creation of “G” to Appius Claudius Caecus, famed for the first aqueduct (“Aqua Appia”) and the first long-distance paved road, (“Via Appia” or Appian Way.) Appius lived about a century before “G” shows up in surviving inscriptions, and he is credited with many legacies that are demonstrably not his doing (he did sponsor the aqueduct and the road) because he was responsible for so many improvements in Rome’s infrastructure. The earliest textual sources attribute the creation of “G” to Ruga, and Appius is only given credit later. As Ruga was a commoner and Appius a patrician Claudian and consul, it seems to be a case of trying to steal the credit from an ordinary citizen. Cicero, Plutarch, Scaurus, and Pliny, among others, felt the credit was due to Ruga.